Including both LGBT older people and older people living with HIV as target populations in the reauthorization of the Older Americans Act, which provides funding for programs like Meals on Wheels and others that allow people to age in place. Supporting national civil rights legislation to protect LGBT older people and others from discrimination on the basis of sexual orientation or gender identity. Mandating more federal government engagement and coordinated research on HIV and aging. As we commemorate the 50th anniversary of Stonewall and the founding of the modern-day LGBT rights movement, our elders sent a loud and clear message to Congress that we will continue to fight relentlessly until all LGBT elders and older people living with HIV gain the protections they deserve. Sign a letter to your member of Congress telling them to protect LGBT pioneers. Over 120 LGBT elders, allies, affiliate leaders and activists from across the nation descended upon Washington, D.C. for SAGE’s inaugural National Day of Advocacy. 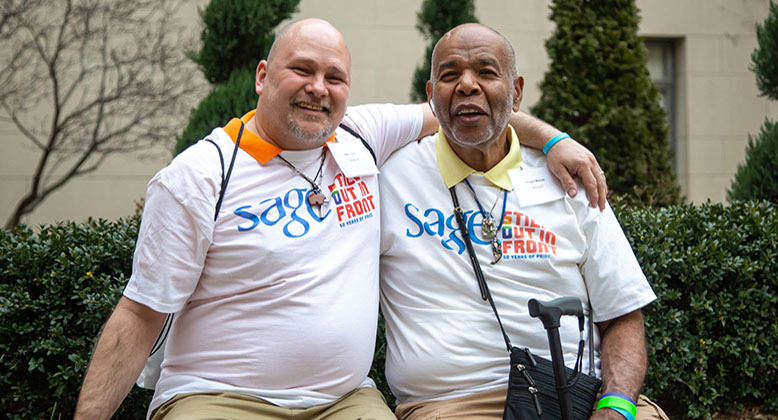 See LGBT elders participating in SAGE’s National Day of Advocacy in Washington, D.C.